Британским Министерством авиации была подготовлена и выпущена спецификация 26/23 на двухместный дневной бомбардировщик средней дальности. Компания "Hawker" спроектировала и построила согласно этому техническому заданию прототип двухстоечного биплана. Самолет ДальшеMore>>> имел крылья разного размаха с несколько скошенными назад внешними секциями, подкосное хвостовое оперение, неубирающееся шасси с хвостовым костылем и силовую установку на базе V-образного двигателя Rolls-Royce Condor III. Прототип, получивший обозначение Horsley, совершил первый полет в 1925 году. В результате успешных эксплуатационных испытаний компании-разработчику был выдан контракт на 20 самолетов Horsley Mk I, ставших последними самолетами цельнодеревянной конструкции, построенными этой компанией. Появившийся затем вариант Horsley Mk II имел уже смешанную деревянно-металлическую конструкцию, а модификация Horsley Mk III, поступившая в эксплуатацию в 1929 году, была уже полностью цельнометаллической. Самолеты Horsley поступили сначала в 11-ю (бомбардировочную) эскадрилью, а к началу 1928 года они состояли на вооружении уже четырех эскадрилий. В том же году они стали использоваться в качестве бомбардировщиков-торпедоносцев, а в 1931-1933 годах часть цельнометаллических бомбардировщиков-торпедоносцев была переоборудована в буксировщики мишеней. В общей сложности были выпущены 120 самолетов всех модификаций, они оставались в эксплуатации в Великобритании вплоть до 1934 года, а в 36-й эскадрилье, дислоцировавшейся в Сингапуре, даже до 1935 года. В дополнение к самолетам, строившимся для британских ВВС, компания собрала еще шесть самолетов Horsley Mk II смешанной конструкции для морской авиации Греции, а два трехместных торпедоносца-бомбардировщика со звездообразными двигателями Armstrong Siddeley Leopard II мощностью 800 л.с. были отправлены в Данию под обозначением Dantorp. Планировалось организовать лицензионный выпуск самолетов в самой Дании, но эти планы не были реализованы. Ряд самолетов Horsley в период с 1926 по 1937 год использовались для испытаний двигателей. 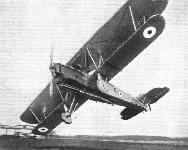 THE "Horsley" is a composite timber and metal machine, and is the standard day bomber of the Royal Air Force. 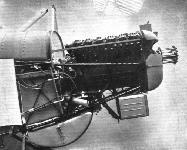 The power unit is the Rolls-Royce "Condor," III, geared engine, and in addition to the bomb load, the machine is provided with two Vickers guns, one for the observer, and one firing forward. A prone bombing position is provided for the observer, giving an unrestricted field of vision. The "Horsley" possesses a remarkable degree of control and manoeuvrability, and despite the size, can be handled with the ease of a scout machine. Fuselage. - The front portion of the fuselage is of steel tubular construction, the remainder being of timber with wire bracing. The engine mounting is a triangulated structure of steel tube and is singularly free from vibration. The equipment is very accessible, and there is sufficient accommodation to allow the gunner to move freely from the firing to the prone bombing position. The pilot's seat is adjustable and provision has been made whereby an additional gun, firing downwards, can be quickly fitted if required. Wings. - The wings are of the two-bay type, and a modified Gottingen section is utilised. The spars are of the box type of timber construction with steel wire bracing. The ailerons are fitted to the top planes only, and the interplane struts are of steel tubing. The centre section incorporates two petrol tanks of 115 gallons each (517 litres), and the design of the tanks is such as to allow the wire bracing to go straight through. Tail Unit. - The tail unit is a composite structure of steel and timber. The rudder is of the balanced type, and the tail skid is of ash with an iron shoe, utilising rubber in compression for taking landing shocks. 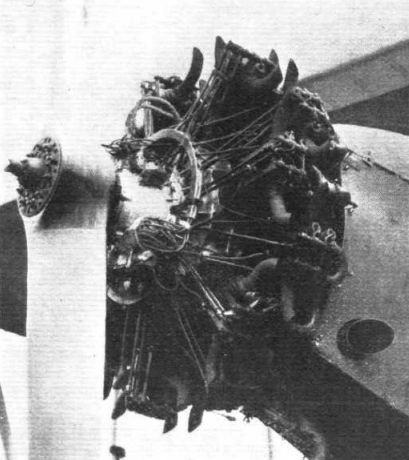 Engine Installation. - The "Condor" III engine is mounted in a steel structure and the cowling is quickly detachable permitting of easy inspection. The radiator is of rectangular section with A. B. tubes. A "header" tank is fitted in front of the engine and there is adequate cooling area. Undercarriage. - The undercarriage is of the split axle type and is of steel tubing throughout. The shock absorbing gear is on the oleo principle, and the design of the axles allows for the fitment of the largest size bombs. 33-я (бомбардировочная) эскадрилья британских ВВС была перевооружена на бомбардировщики Horsley в 1929 году. Но карьера самолета в данной эскадрилье оказалась не особо длинной - с 1930 года она стала первым подразделением британских ВВС, перевооружившимся на Hawker Hart. The Hawker "Horsley," with Rolls-Royce "Condor" engine, now the Standard Day-Bomber of the Royal Air Force, is an aeroplane of outstanding merit. It was officially selected after competitive trials with other machines and has a remarkable all-round performance record. This illustration depicts the machine being tested by Flight Lieut. P. W. S. Bulman, at Brooklands. LONDON - ? NON-STOP: This photograph shows the service type Hawker "Horsley" with Rolls-Royce "Condor" engine. It is on a similar machine, but considerably altered internally in order to carry more than 1,000 gallons of petrol, that an attempt is to be made this spring to beat the existing non-stop record (Paris - Jask). SOME STARTERS IN THE KING'S CUP RACE: Mr. Bulman roaring away on the Hawker "Horsley," the only machine to carry "rings" in the race. AT FULL SPEED: The Hawker "Horsley" with Rolls-Royce "Condor" engine, piloted by Flight-Lieut. Bulman, flying past the hangars at Brooklands. The inset shows the machine at the top of a loop, an evolution which this astonishing machine seems to perform with the greatest ease. 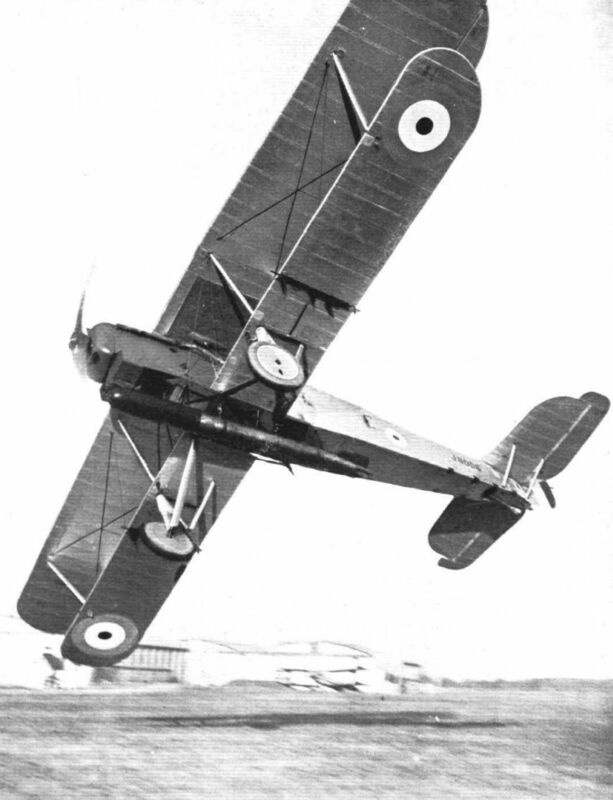 HAWKER "HORSLEY": Day Bomber, with Rolls-Royce "Condor" Engine. 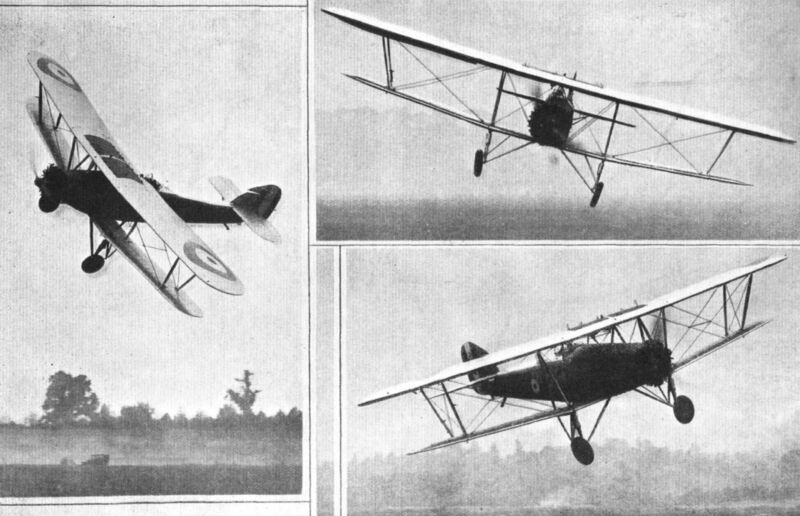 THE "CYGNET'S" BIG BROTHER: In spite of its powerful "Condor" engine, Mr. Bulman handles the Hawker "Horsley" as if it were a light 'plane, as these photographs show, and in his hands the manoeuvrability of the machine is extremely good. 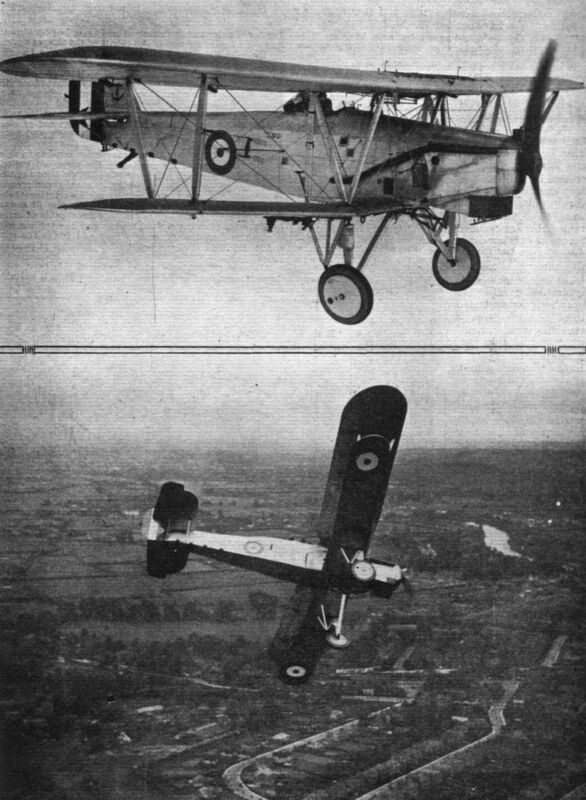 THE FLIGHT TOWARDS INDIA: Three photographs of the Hawker "Horsley" in flight, piloted by Lieut. 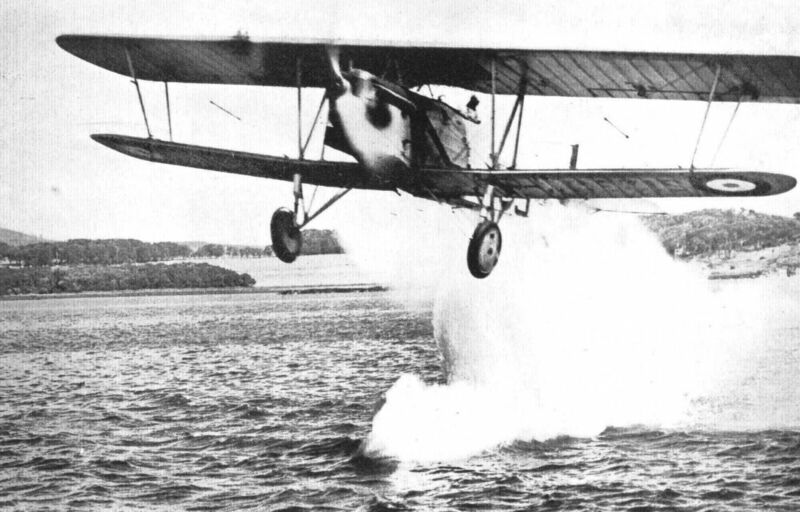 Bulman, during tests at Brooklands. 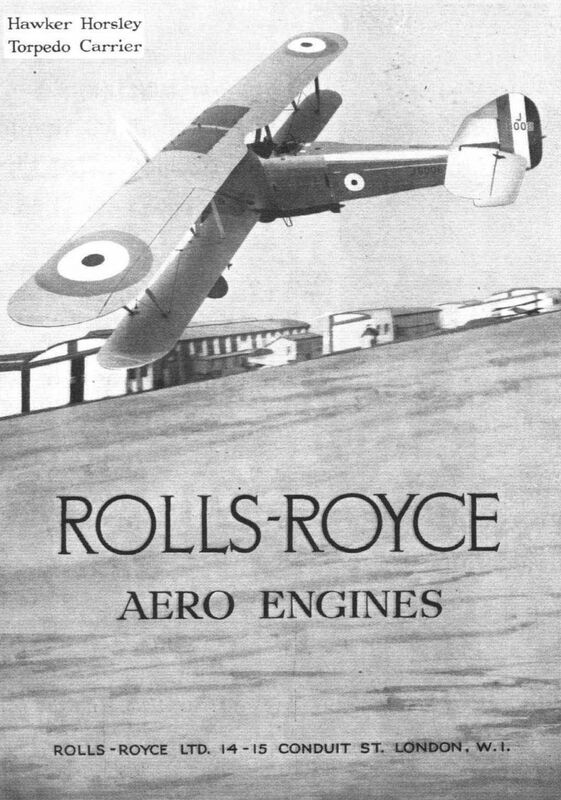 The Hawker Horsley, with Rolls-Royce Condor engine, supplied to the order of the Greek Government. 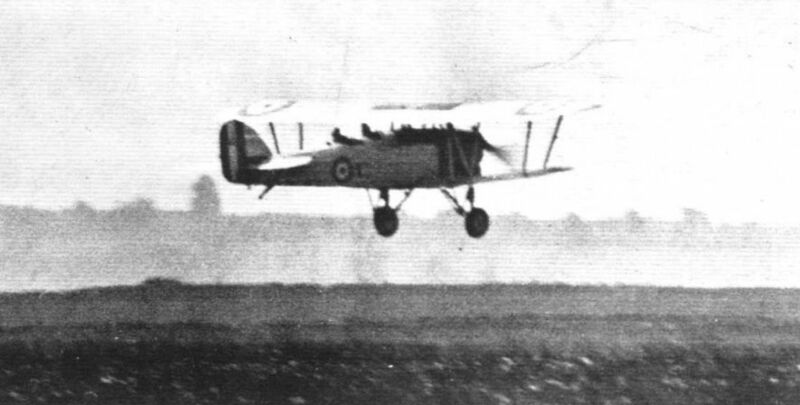 EN ROUTE: Above, the Hawker "Horsley" shortly after leaving Cranwell aerodrome. Below, Flight-Lieut. 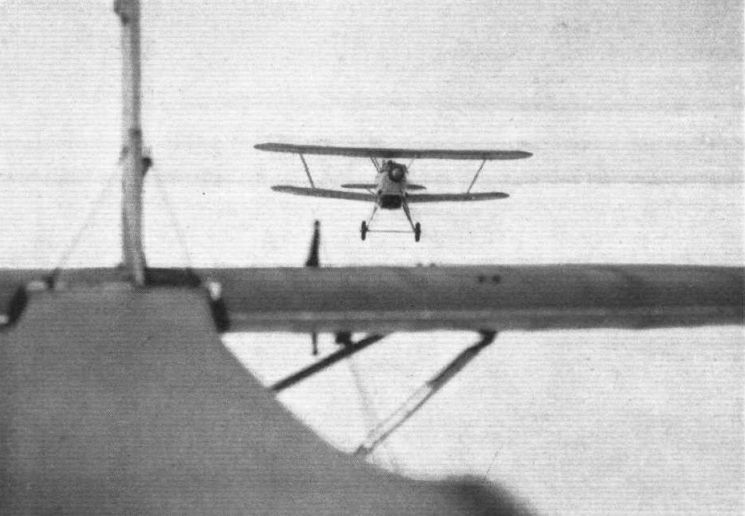 Carr flies up close to another machine (from which these photographs were taken) in order to signal to Flight-Lieut. Bulman (who was piloting the second machine) that he is having trouble. A few minutes afterwards oil was seen to spurt from the machine, and it was then Carr made his decision to land at Martlesham. 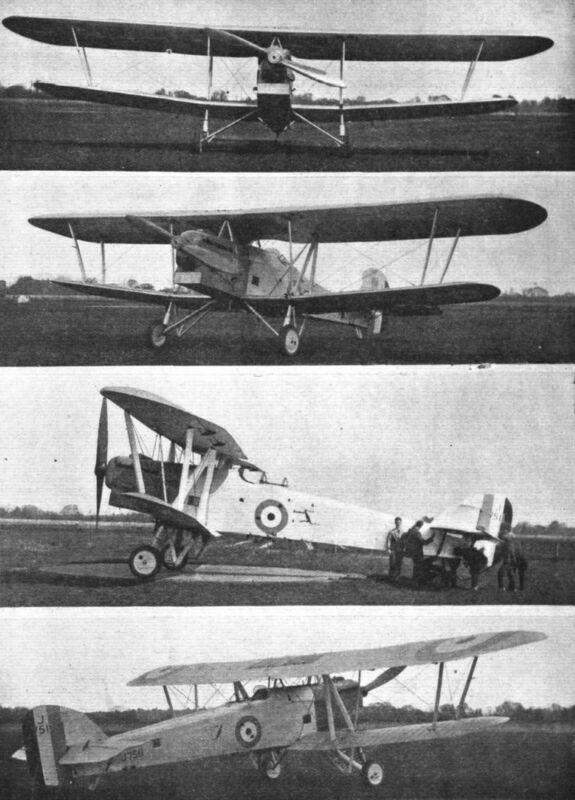 HORSLEYS FOR HELLAS: These photographs show the first of a batch of Hawker "Horsleys" on order for the Greek Government, two of whose representatives, Commander Falconakis and Lieut. Plastiras, may be seen on board. The pilot was Lieut. 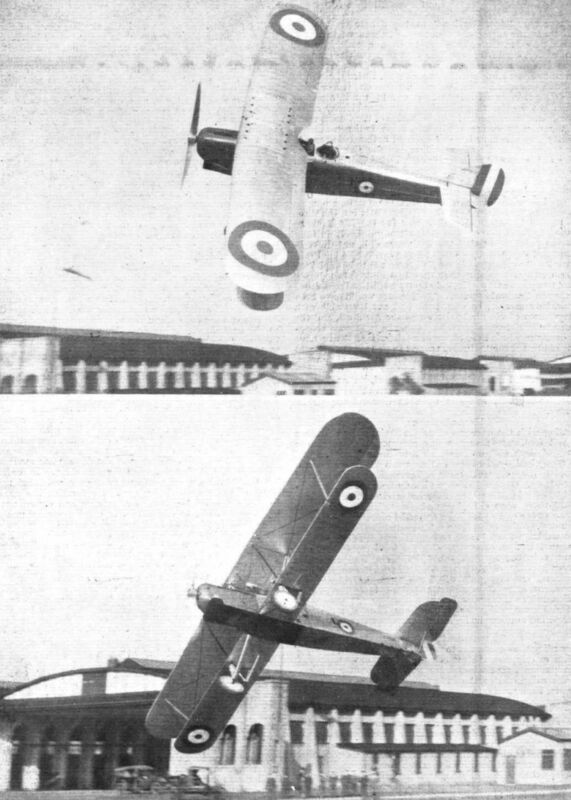 Bulman, and the photographs, which were taken from another aeroplane, indicate the manoeuvrability of the machine which, in the lower picture, is in an almost vertical bank. 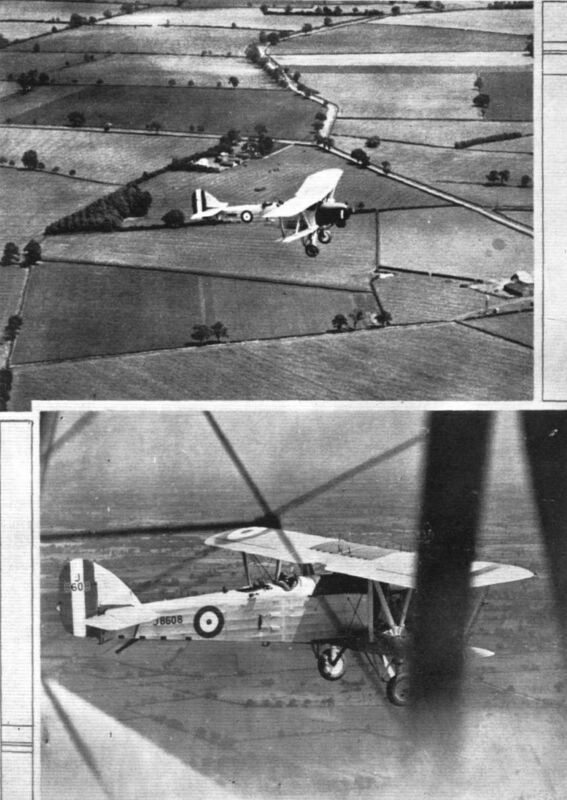 THE IMPROMPTU SAFETY DEMONSTRATION: The upper photograph shows the Hawker "Horsley" taking off from Cranwell aerodrome. In the centre is depicted the historic moment when Flight-Lieut. Carr landed the machine without Straining a single thing. Note the little puff of dust where the wheels first touched, and also that the landing was a "three-point" one. 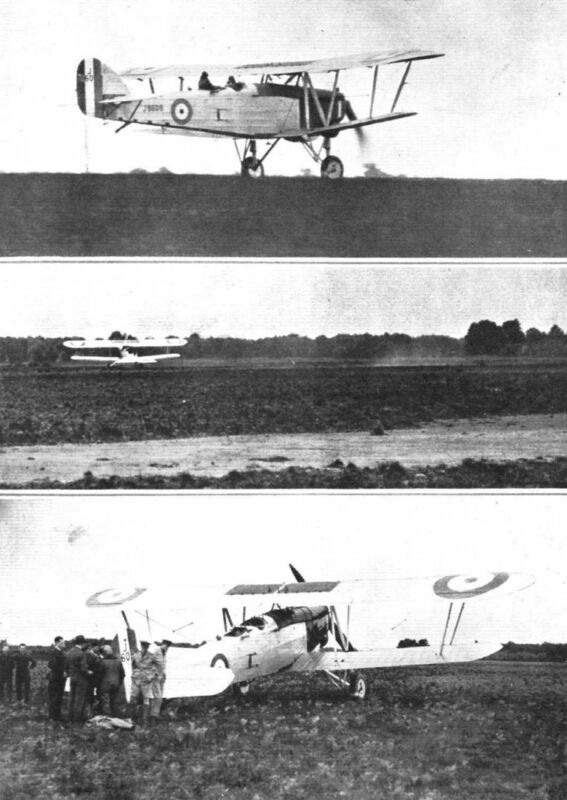 The lower photograph shows the machine at Martlesham just after landing. It is quite obvious that the machine is intact, even to its Palmer tyres. The Hawker "Horsley." 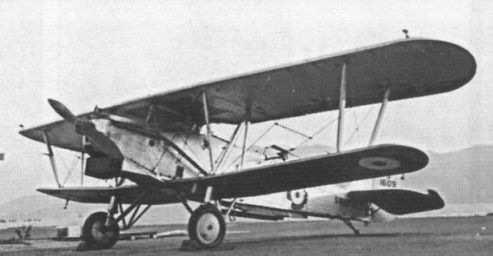 (Rolls-Royce "Condor") Although a day bomber like the Fairey "Fox," the Hawker "Horsley," is a vastly different type of machine. To begin with, it has a 700 h.p. Rolls-Royce "Condor" instead of the 430 h.p. of the "Felix," and secondly it has the usual excrescences upon which, apparently, the Air Ministry insists, or insisted until Mr. Fairey produced the "Fox." Also it is a very much larger machine than the "Fox." For all that, the "Horsley" has proved itself a very fine machine, and the internal arrangement of all the paraphernalia is something to be wondered at. The "Horsley" has now gone into quantity production. 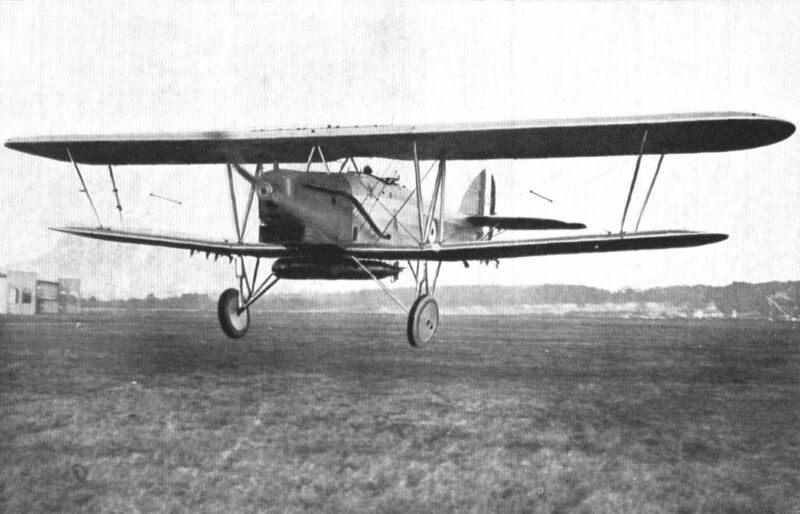 A MODERN DAY-BOMBER: The Hawker "Horsley" is fitted with a Rolls-Royce "Condor" Engine of 650 h.p. The machine, it will be seen, is of very "clean" design, and is characterised by a bottom plane considerably smaller in span and chord than the top plane. The cowling around the engine is particularly neat. 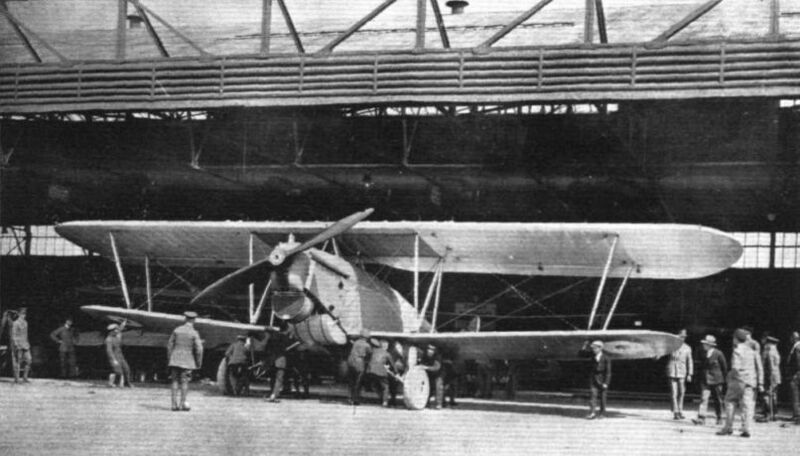 A HAWKER DAY BOMBER: This photograph shows the Hawker "Horsley," with Rolls-Royce "Condor" engine, which is now going into production for the Royal Air Force. Several unusual features are disclosed by the photographs, but technical details of the machine may not yet be published. 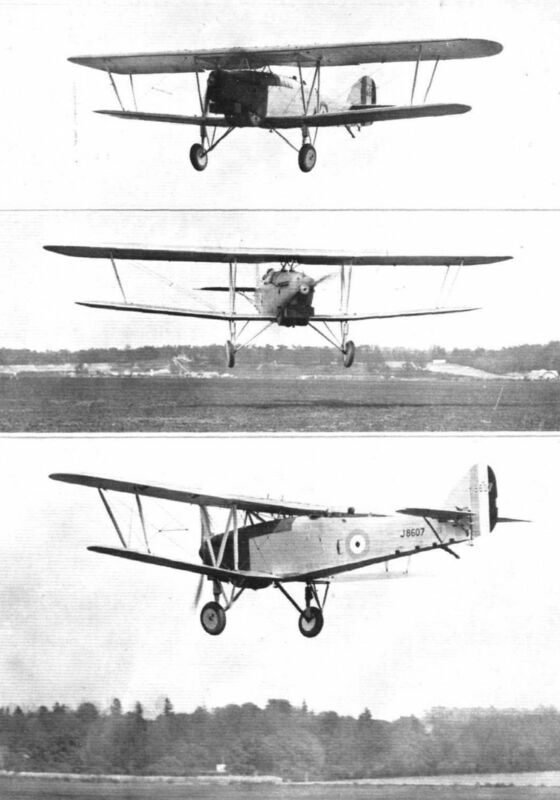 FLIGHT TOWARDS INDIA: These three views show the Hawker "Horsley" with Rolls-Royce "Condor" engine on which Lieuts. Carr and Gillman are attempting a non-stop flight from England to India. The machine, it will be seen, has undergone remarkably small external changes, and is to outward appearances almost identical with the standard service type of machine in use by the R.A.F. To have managed to stow some 1,100 gallons of petrol into the machine without spoiling its remarkably clean lines is something of an achievement. QUANTITY PRODUCTION: A few of the Hawker "Horsley" bombers with Rolls-Royce "Condor" engines ready for delivery to their squadrons. The machines are here seen outside the Hawker sheds at Brooklands. No.1 AIR DEFENCE GROUP: The concentration of six squadrons of the Group at Manston on Friday, August 5. Misty weather prevented some squadrons from arriving in full strength. The squadrons are Nos. 501, 504, 600, 601, 604, and 605. All fly "Wapitis" except No. 504, whose "Horsleys" are drawn up in two lines in the rear. 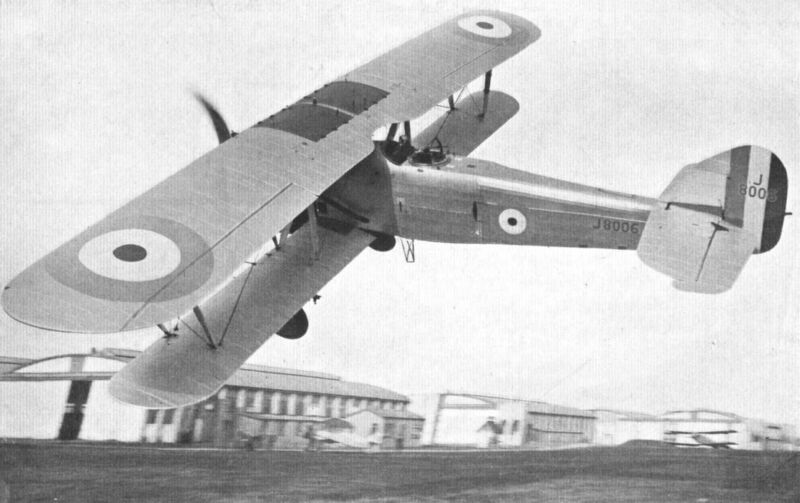 HAWKER "HORSLEYS" FOR GREECE: The last Hawker "Horsley" of a batch ordered by the Greek government was delivered recently. 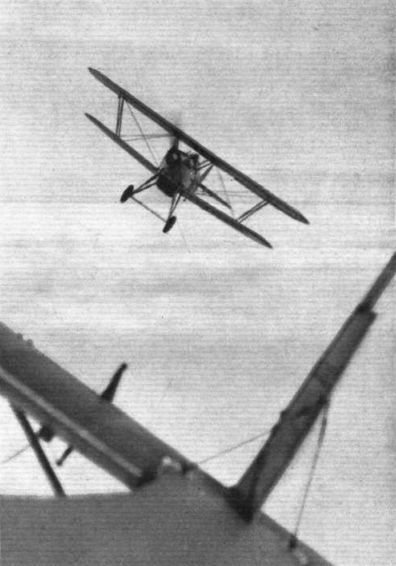 Mr. Bulman, Hawker's Chief Test Pilot, carried out flight tests before the Greek authorities and gave a very fine demonstration. 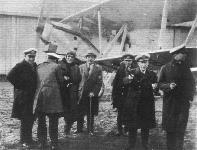 Mr. Bulman is seen, in the left-hand photograph, leaving the machine with the Greek Minister of Marine. SIR SEFTON BRANCKER IN GREECE: Air Vice-Marshal Sir Sefton Brancker recently visited Athens in connection with Civil Aviation developments and flew from Tatoi Aerodrome to Salonica in one of the Hawker "Horsleys" recently supplied to the Greek Naval Air Service. Our picture shows Sir Sefton (3rd from left) ready to leave, with Mr. A. C. Coutroubis (4th from left) and Capt. 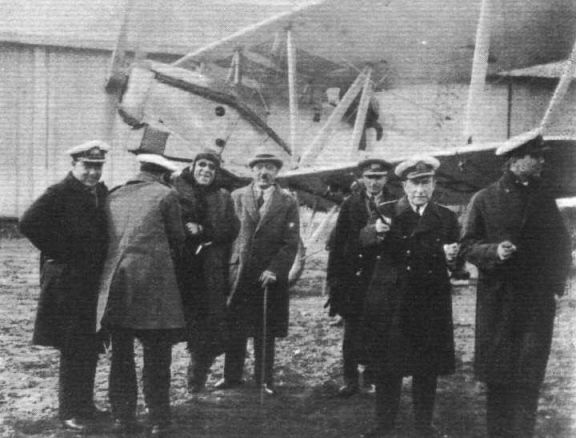 Voulgaris, Director-General of Ministry for Air (6th from left). 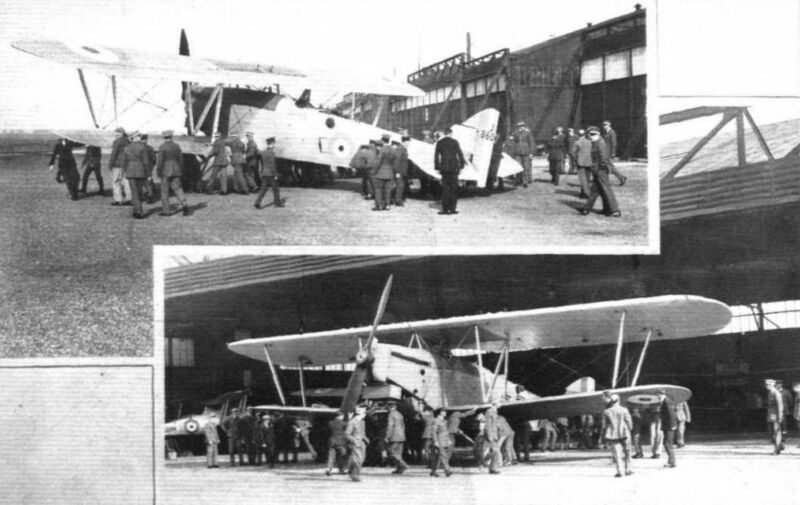 THE FLIGHT TOWARDS INDIA: Bringing the Hawker "Horsley" out of its hangar at Grantham on the morning of the start, and wheeling it towards the aerodrome. A HIGHLY SUCCESSFUL FAILURE: The Hawker "Horsley," with Rolls-Royce "Condor" engine, being brought out of its shed at Cranwell before the start last week. 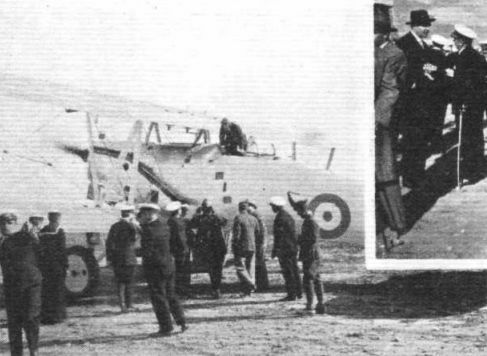 THE FLIGHT TOWARDS INDIA: The Hawker "Horsley" being taxied across the aerodrome to the starting point, followed by interested onlookers. 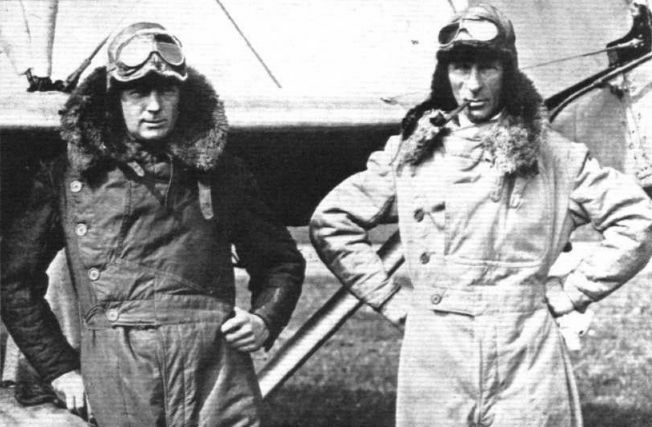 "THEORETICAL ENEMIES" LEAVING THEIR BASE: Two of the Hawker "Horsleys" of No. 100 Squadron leaving Andover on the first day of the Manoeuvres preparatory to attacking London. 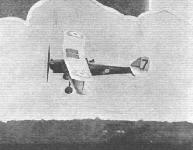 THE TENSEST MOMENT OF THE CRANWELL - BANDER ABBAS FLIGHT: The Hawker "Horsley" taking off from the Cranwell aerodrome. The start had to be made at an angle with the prepared course, owing to a change in the wind direction, and the machine was bumped into the air by the sloping side of a gully. WHERE IS THAT BATTLESHIP? 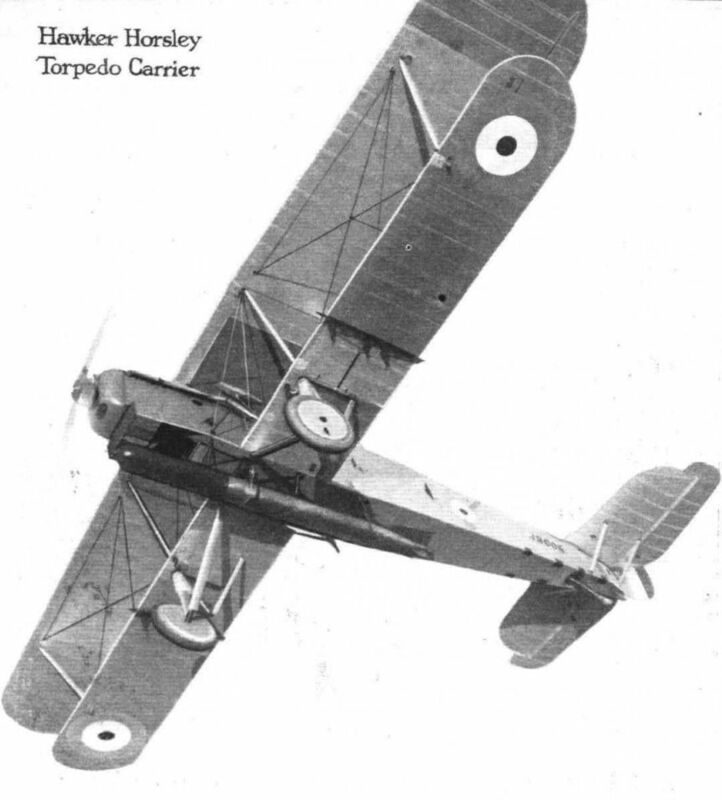 The Hawker "Horsley" torpedo-carrier, with Rolls-Royce "Condor" engine, is the latest form which this surprising machine has taken. 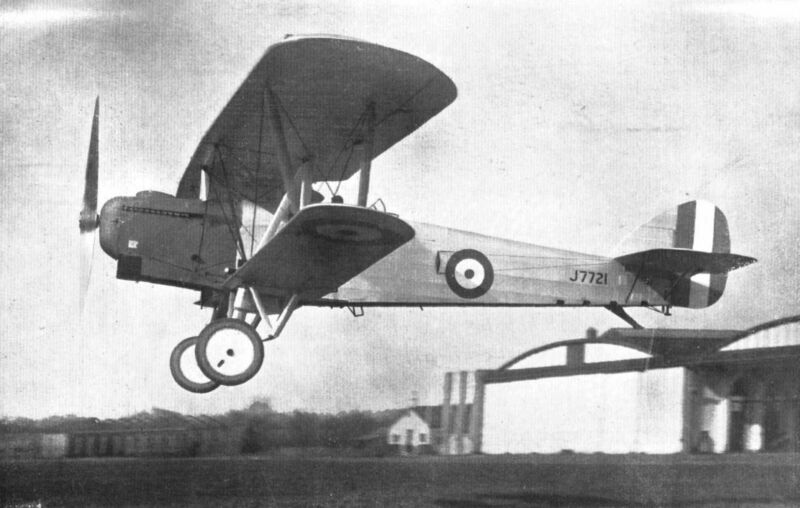 Normally, it is the standard bomber of the R.A.F., but has also been produced as a long-distance aeroplane. The "HORSLEY" Torpedo Bomber, now in production, represents the most efficient and advanced machine of this type. Particulars can be supplied to Colonial and Foreign Governments on application. 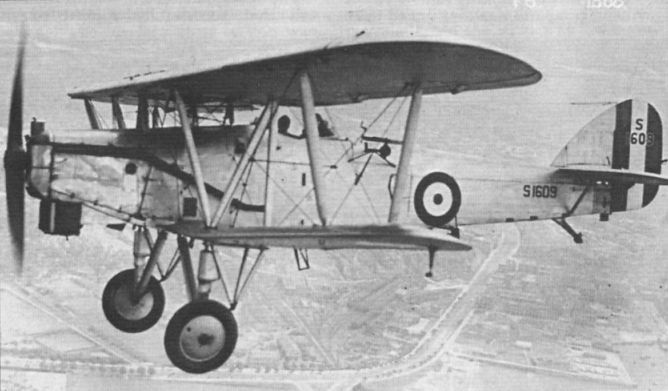 A photograph of a Hawker "Horsley" - Rolls "Condor." 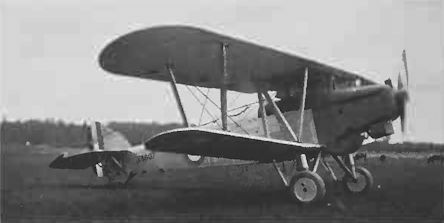 SHOWING ITS STING: The Hawker "Horsley" with Rolls-Royce "Condor" engine, in spite of its size, is handled like a scout by Flight-Lieut. Bulman. The full-size torpedo looks almost small on this large machine. 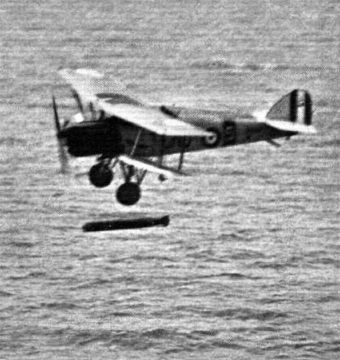 DROPPING: A "Horsley" after diving down to 15 feet from the surface discharges a dummy torpedo. The island of Inchkeith is in the background. DROPPING A "MOULDIE": A Hawker "Horsley" of No. 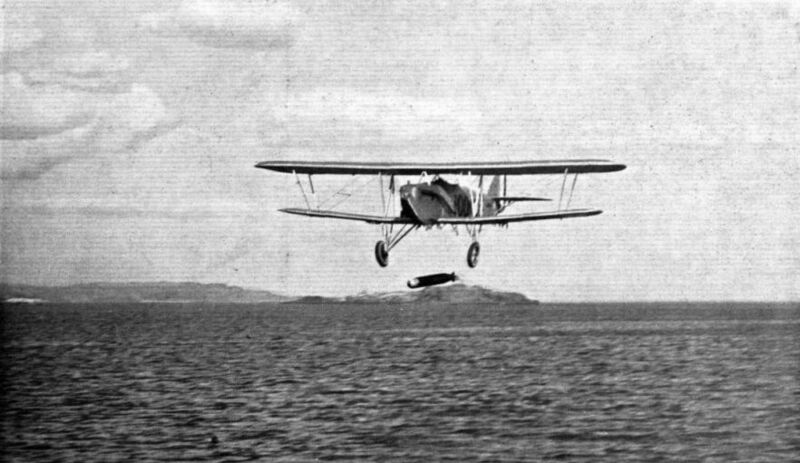 36 Squadron discharging its torpedo over the Firth of Forth. It will be recollected that the long-distance "Horsley," generally similar to the Service type, carried more than its own weight in fuel, crew, etc. These six pictures from a cinematograph film show stages in the discharge of a torpedo. 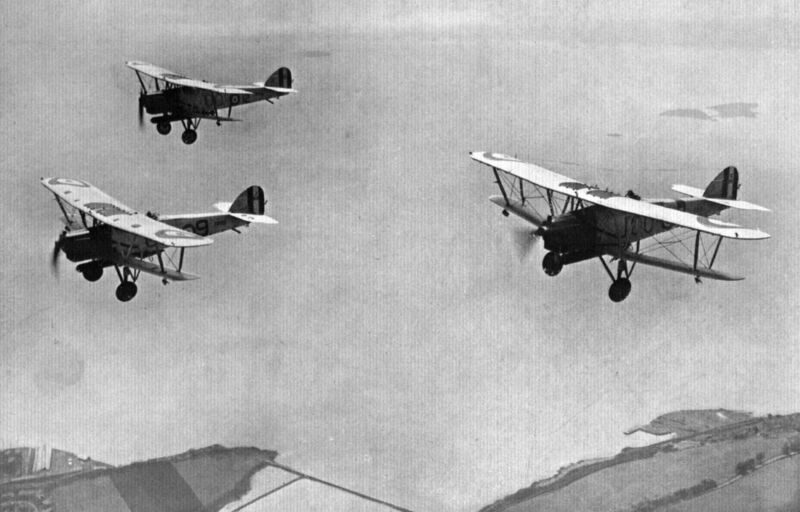 OVER THE FIRTH OF FORTH: Three Hawker "Horsleys" ("Condor") of No. 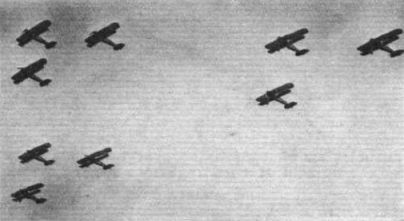 100 (Bomber) Squadron carrying torpedoes patrolling the approaches to Rosyth base. 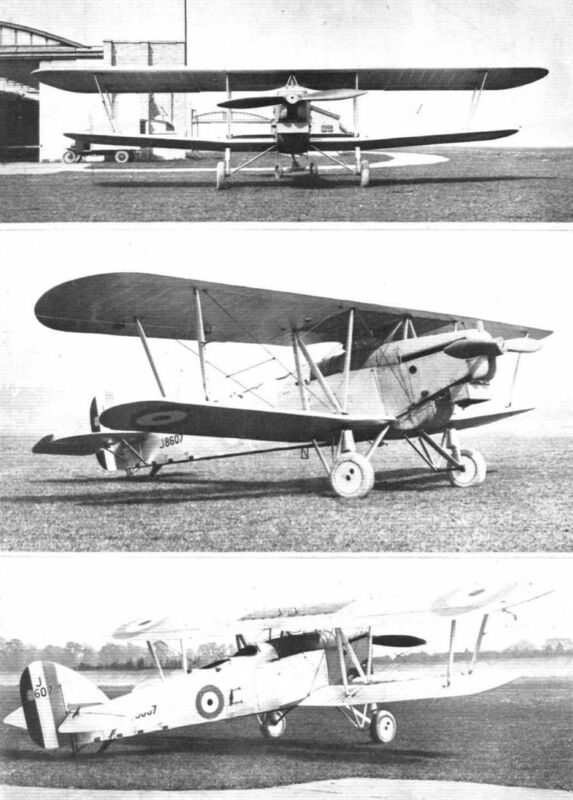 A flight of three Hawker "Horsleys" (Rolls-Royce "Condor") of No. 100 (Bomber) Squadron diving to the attack. A CADRE SQUADRON: No. 504 (County of Nottingham) (Bomber) Squadron flying to Manston. The machines are Hawker "Horsleys" (Condors). PIRATES BOLD: The Pirates try to take off in the stolen aircraft, but bombs are dropped by British "Horsleys'' (on photo) with good effect. 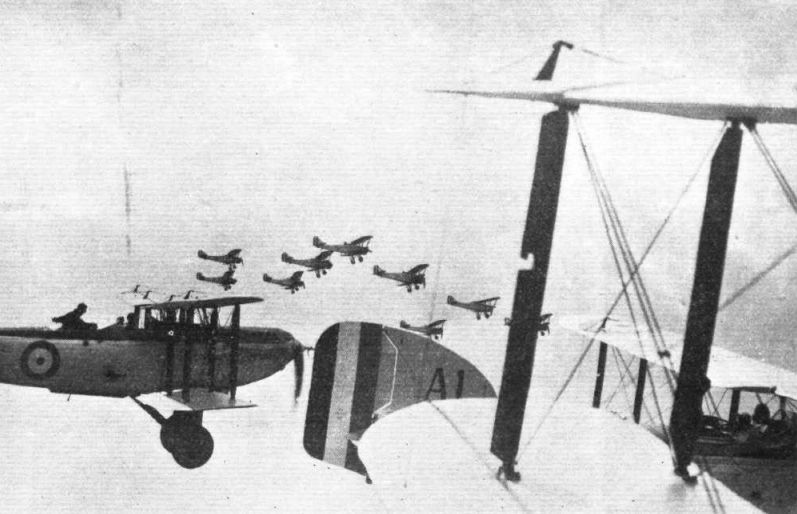 AIR FORCE DISPLAY: Hawker "Horsleys" at drill movements in formation. 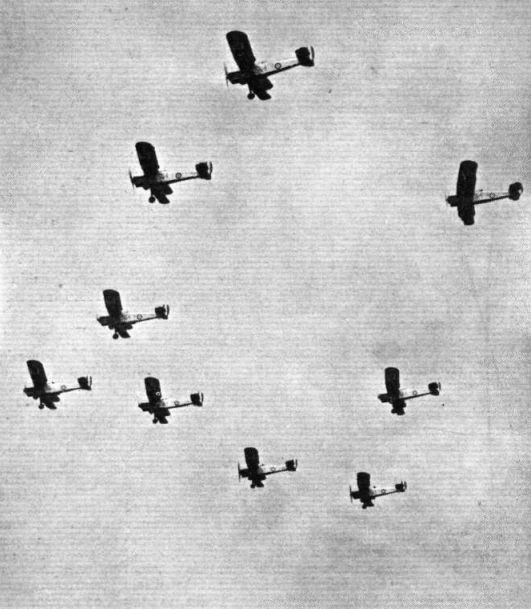 Each Squadron passed in succession from different directions performing similar drill orders. 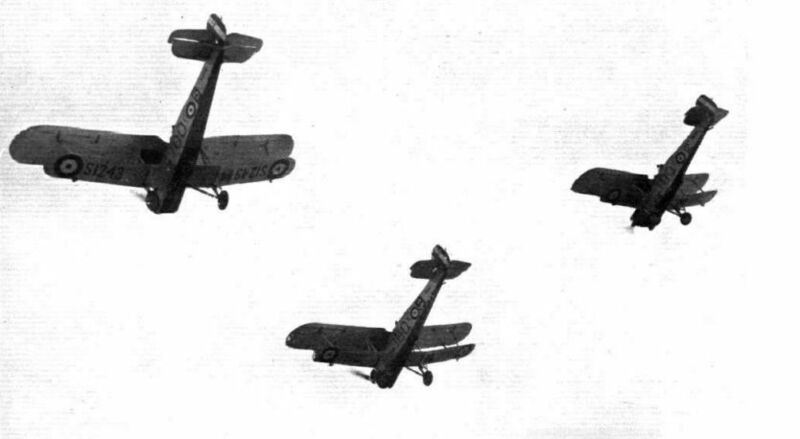 In Formation: A squadron of Hawker "Horsleys" in the clouds. 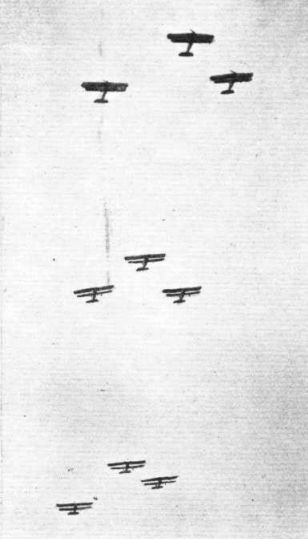 AT HENDON: This is view taken from a Fairey IIIF machine over Hendon of the R.A.F. machines practising during the week for the Display on June 30. 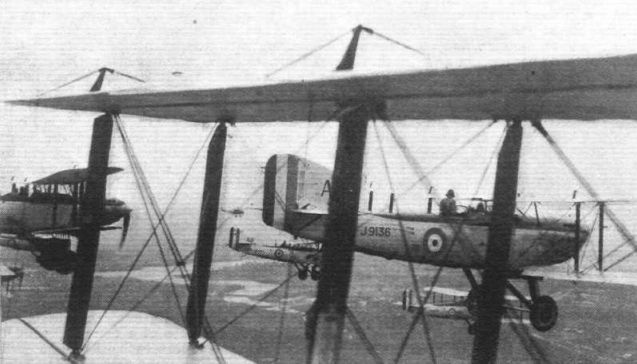 Fairey IIIF's are in the foreground and Flights of Hawker "Horsleys" in the distance. Rehearsing for the R.A.F. Display: Struts interfere somewhat with the view, but nevertheless quite a number of Fairey III F's may be seen flying over the Welsh Harp, with a Hawker "Horsley" looking very small in the background. 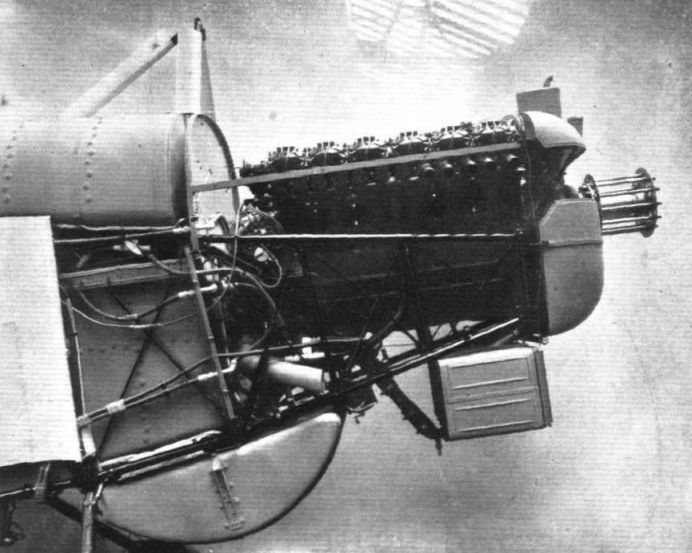 A Rolls-Royce petrol engine, converted into a compression-ignition unit, undergoing flying tests at the Royal Aircraft Establishment, Farnborough. 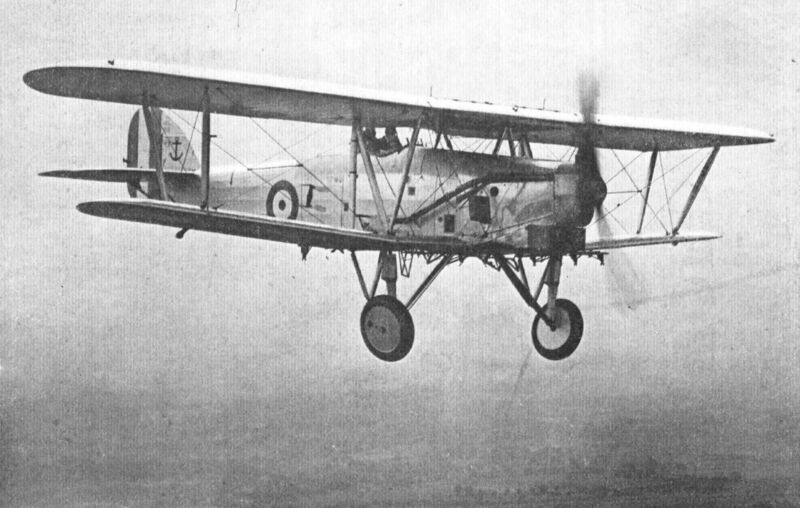 Hawker Horsley S1609 was part of the final batch of RAF Horsleys delivered during 1931. 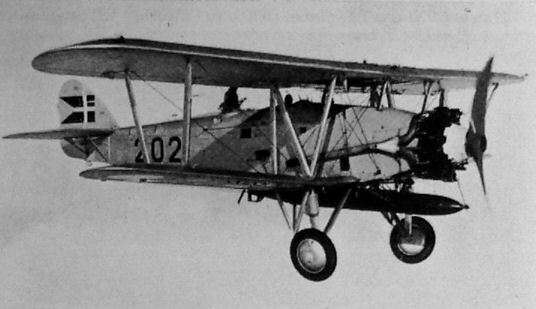 This all-metal torpedo bomber was powered by a 665 h.p. Rolls-Royce Condor IIIA engine and carried a single 2,150 lb torpedo. 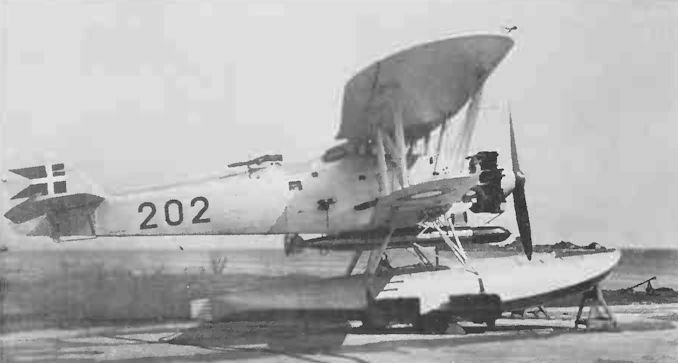 This Horsley is fitted with target towing gear - note the target cable drum and wind-driven winch attached to the side of the rear cockpit. About a dozen Horsleys were thus converted. Another view of Horsley S1609. 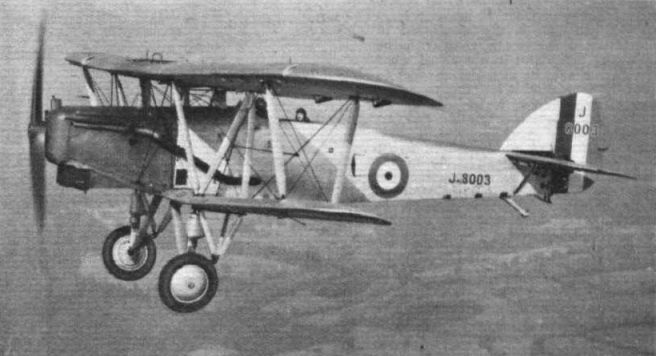 Hawker Horsley J8620 was a test-bed for two Jumo IV compression-ignition engines, flown successively. 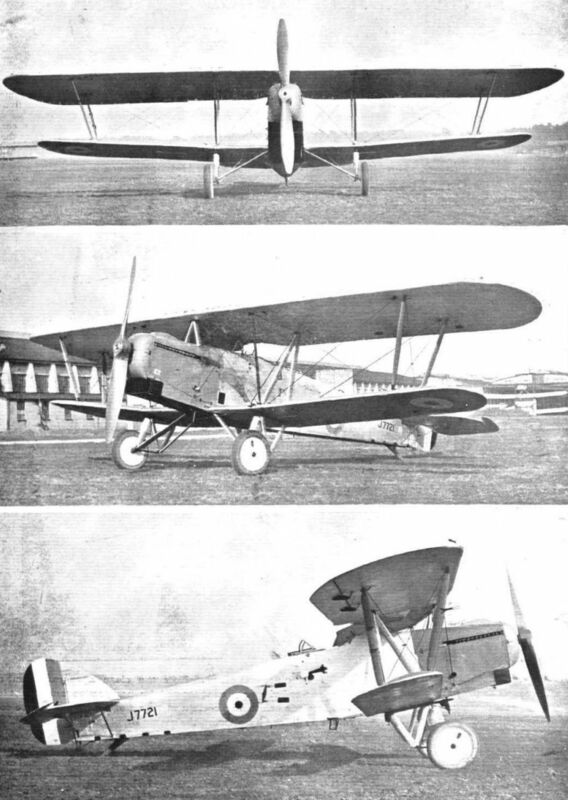 THE UBIQUITOUS "HORSLEY": These photographs show a Hawker "Horsley" fitted with one of the new Armstrong-Siddeley "Leopard" radial engines which resemble the famous "Jaguar" in many respects but are of much higher power. The "Horsley-Leopard" combination has provided valuable information and there would seem to be no end to the purposes for which the "Horsley" can be successfully used. 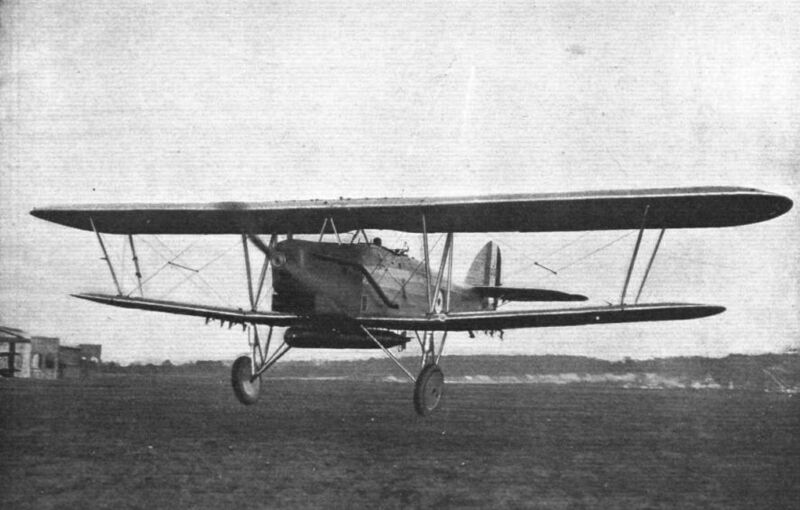 A Hawker "Dantorp" (Siddeley "Leopard") of the Danish Army Air Force. 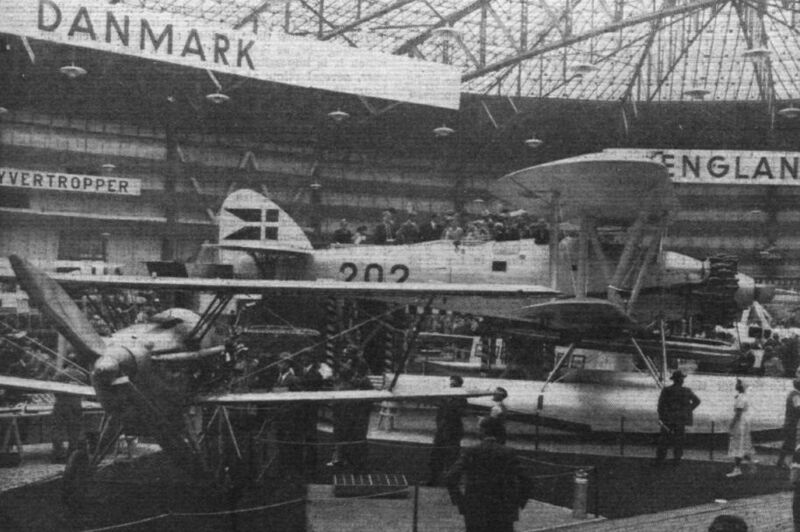 A general view from the opposite end of the Forum hall, with the Caudron monoplane on the left, the Russian machine on the right, and the Danish-built Hawker "Dantorp" beyond. Suspended from the roof is the Danish glider. The Armstrong-Siddeley "Leopard" Aero Engine as fitted in a Hawker "Horsley" bomber. The Flight Towards India: Flight-Lieut. Charles R. Carr, D.F.C., and Flight-Lieut. 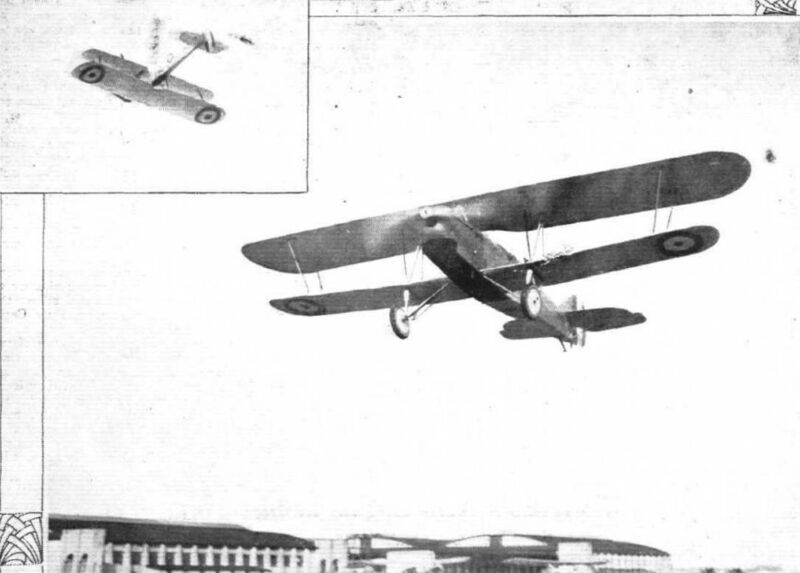 Leonard E. M. Gillman, by the Hawker "Horsley'' with Rolls-Royce "Condor" engine, on which they are attempting a nonstop flight from England to India. Lieut. Carr is chief pilot, while Lieut. Gillman is second pilot and navigator. 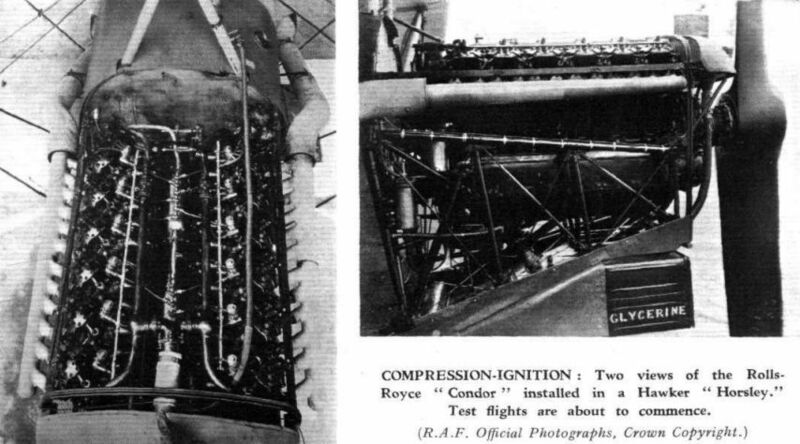 A Responsible Position: The Rolls-Royce "Condor III" engine, as installed in the Hawker "Horsley"
COMPRESSION-IGNITION: Two views of the Rolls-Royce "Condor" installed in a Hawker "Horsley." Test flights are about to commence. THE PETROL TANKS OF THE "HORSLEY": On the left, the deck fairing tank. 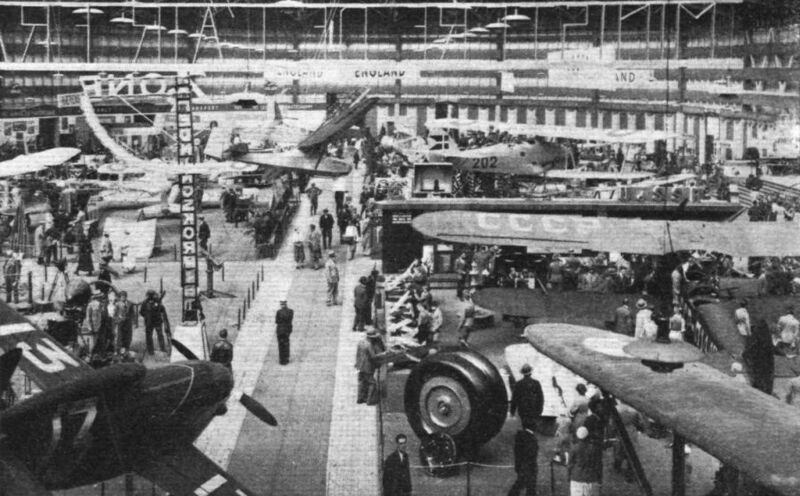 In the centre, the aft fuselage tank, and on the right the front fuselage tank. 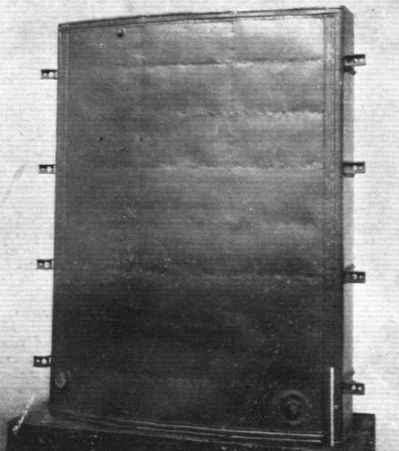 The centre-section tank of the Hawker "Horsley."